On today’s agenda: Blue Ridge Parkway and Natural Bridge, VA then on to stay in Harrisonburg. We have fallen into a comfortable routine. Each evening when we land in whatever hotel we find – as true wanderers we refused to be tethered to exact locations each night – we schlep our suitcase, cooler and computer to our room. I connect the computer to wi-fi as Larry empties the cooler of its contents. Then I stretch across the bed, familiarize myself with our location while Larry commanders the computer. As an online purveyor of antique paper products – old ads, postcards, photos and the like – he’s compelled to check in. In the mornings we get up when we wake up, typically around 7. We shower then head down to breakfast. I fuel up on coffee while digging through my map app to plot our day. Larry pockets an extra banana or granola bar. Back in our room I re-pack the suitcase, Larry packs the cooler, the computer is checked once more by both of us and we’re off. This morning is no different. I discover over breakfast that we are comfortably close to the Virginia border. This is the state I consider home. I was born in Washington DC and lived nearly all of my formative years – until almost 30 – in northern Virginia. It is an absolutely beautiful state and I feel at home the moment we cross the border. We stop at the welcome center. I am growing very fond of these tiny houses full of maps and brochures. The people who staff them are like geographic librarians or historians. They seem to know about everything in the state in which they live. We pick up no less than 50 individually folded pieces of paper. A few of them even helpful. We decide to travel the Blue Ridge Parkway. If I can offer one piece of advice while traveling on the western edge of Virginia it is this: Always travel the Blue Ridge Parkway. I could not stop commenting on the beauty. The trees were still full of leaves and life, some beginning to wane into rich reds and oranges hinting at the changes to come, but mostly we were enfolded in lushness. I insisted on stopping at every scenic overlook. The view is nearly always the same, I just wanted to get out and inhale as deeply as possible as if to imprint this fresh air into my DNA. Cameras never quite do the view justice. I shoot away nonetheless. Our first stop on the Parkway is an old mill, Mabry Mill. It is now a little tourist spot, but kept as authentic as possible. The mill house can be toured. Inside is a gentleman dressed in puffy clothing impersonating a mill operator in the 1800’s perhaps. I poke my head out the open window to look up at the wheel considering it for a photo but nothing is happening right now. He informs me that they allow the water to build for 30 minutes or so then release it. But he likes me so he does it now anyway. I dutifully insert my head and camera back into the opening and fire away. In the end, I am more impressed by his kindness than my photos. We meander as much as we can in this sweet little spot, watching more authentically clad folk stirring giant pots over open fires. Cooking something. Advancing a step at a time, sometimes sideways to photograph the mill itself. Ensuring I get the best possible angle. Satisfied we have gleaned all we can, we hop back on the parkway. As a child, all the way through high school, my family would take the hour or so drive to the mountains. We would travel along the Blue Ridge Parkway or Skyline Drive until my father found an appropriate picnic place. I loved it, climbing on the rocks, pulling myself up by tree roots, sitting on the edge of nothing enjoying the view. I was struck by the nostalgia of it. It all felt so familiar. Probably, but for today I will imagine living in a quaint town, going to the farmer’s market, hiking my favorite spots in the mountains and decorating for a snowy Christmas. After a couple of hours of blissfully winding through trees we opt to jump on the closest interstate to make up some time. And we’re hungry. The next biggish town is Roanoke. We exit right into the heart of town. There appears to be a street fair or farmer’s market of some sort happening downtown. It feels good here. I can’t recall if I have ever visited Roanoke. I’m not sure if I’m supposed to like it, but I do. 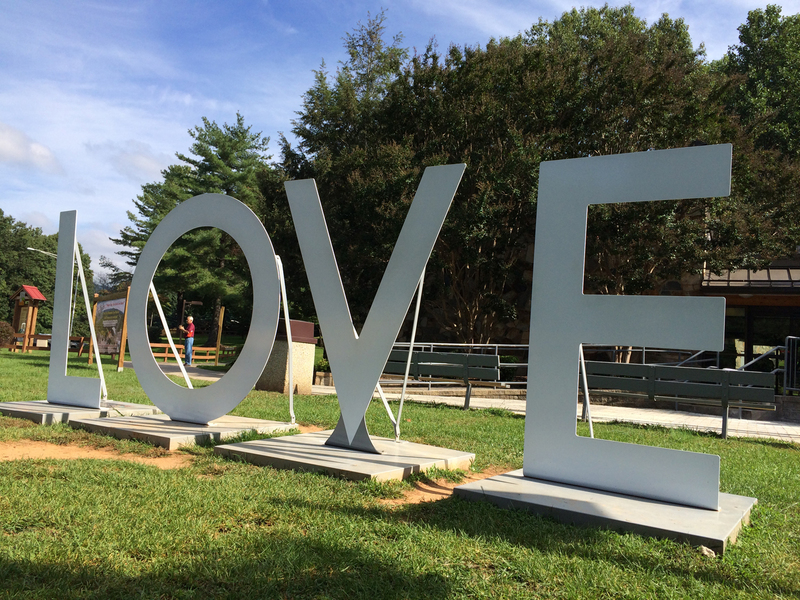 Growing up in Northern Virginia (or anywhere probably) there were certain towns that were completely uncool to like and others that must be visited, lest the status of loser be cast upon you. I have a feeling Roanoke may have been on that first list. But I’m not 14 anymore so I can do whatever I want. There’s a comfortable vibrancy here, the people are friendly and city seems clean. It has the energy of a city that has been through transition and it knows who it is now. It’s comfortable in its own skin. We walk the main drag after perusing the market. There are a handful of nice boutiquey stores and an equal amount of restaurants. Many of the buildings are brick. I love brick buildings – another tug on the nostalgia string. After considering each restaurant, we land in Jack Brown’s Beer and Burger Joint. I mean, how could we not? It is narrow and full. Along the right, a bar reaches from the front to the back – every seat occupied . The left wall hosts a row of two-seater high top tables from front to back and they are nearly all full. We’re seated. After reciting a long list of beers we won’t be drinking this afternoon our waitress explains that we must have the burger and that it is all about Jack’s special sauce. Done. It was quite possibly the best burger I have ever had and it is all about the sauce. They don’t bottle it, I asked. I consider asking for another paper cup of sauce and decide instead to use my knife and then my finger to get the last tiniest bit of sauce from my plate. When I’m satisfied there is no more, I lick my lips and declare it’s time to go. Larry is already standing, looking at me with that “I can’t believe you’re doing that, but I actually can” look. I’ll miss Jack Brown’s but we have a natural bridge waiting for us to admire it. Thanks Kelly! I have a lot of fun doing both.